WordPress comes with great features that make it best CMS of the world. If you want to export or import contents (like pages, posts etc) from one website to another you can do it without touching any coding part. With the help of WordPress import/export tools you can do contents transformation just by 3-4 steps. You can export your posts, pages, comments, custom fields, categories, and tags from one WordPress website to another website by creating an XML file. Download and save this XML file to your computer .and by using import function in other WordPress websites you can import XML file. 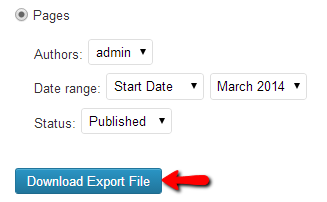 To open Export tool go to Dashboard> Tools > Export. Now click on an Export button it will open a new window. All content – By using this option you can export all content of website including posts, pages, comments, custom fields etc. Posts or Pages– By next two options you can export Posts or Pages content. On selecting Posts or Page option, it will open a new window with different options like authors name, date range, and status. Hence by using these options, you can select your desired pages or posts that you want to export. After doing all settings click on Download Export File. An XML file will automatically start downloading to your computer. You can import posts, page or comments or other content from another WordPress.com or WordPress.org blog or site. To open import tool go to Dashboard > Tools > Import. By default, WordPress does not provide import functionality. Hence to get this feature you have to install a Plugin. On clicking on import .it will open a new window where you can choose a plugin according to your need from the list of plugins. Blogger- is used for Import posts, comments, and users from a Blogger blog. LiveJournal- is used for Import posts from a Live Journal XML export file. WordPress importer- is used for Import posts, comments, custom fields, pages, and categories from a WordPress export file. Now just click on WordPress out of all plugins. It will release a new window .where you click on install now button to install the WordPress importer. Now activate this plugins .after activation it will open a new tab from where you can choose your exported XML file (created by using the export tool) from your computer. Now click on upload and import XML file. It will automatically add your exported content to your website and that’s it.